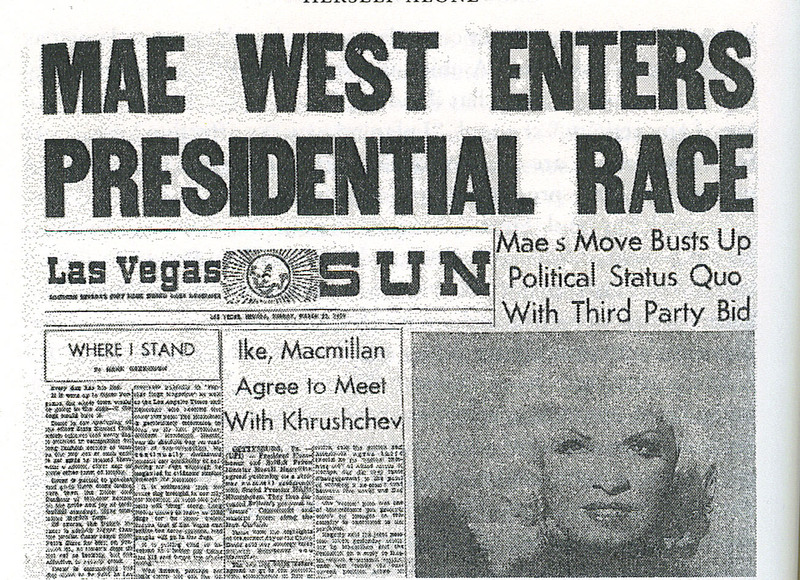 MAE WEST Enters the Presidential Race! • • In 1959, a few months before Mae West's autobiography would be published, The Las Vegas Sun ran a spoof headline about the presidential race between Richard Nixon and John F. Kennedy. Which new candidate would be campaigning to run the White House? Mae West was about to launch her "third party" bid from the Sahara Hotel, said the Sun, all in fun. • • How many think that actress Mae West probably would have done a better job on Pennsylvania Avenue than actor Ronald Reagan did? • • Maybe you can't vote for an actress today on November 6th, however, you CAN enjoy several biographies and other books about Mae West. Many are available at a nice price at your favorite online bookseller. • • The awe-struck tone is obvious in the article "At the Capitol — First Appearance of Mae West." Although the reporter from Canberra, Australia puzzled over the movie's title and suggested other titles more suitable than "She Done Him Wrong" (such as "Bowery Love"), there was praise for the leading lady. • • So called “sin ships” were party boats anchored off the California coast, former tankers and military vehicles rebuilt for drinking, gambling, and Hollywood-style partying like The Monte Carlo. As a sin ship, it hosted such illustrious visitors as Mae West and Clark Gable until it sunk on New Year’s Eve in 1936. • • Steve Wulf mentioned Mae West. • • Steve Wulf wrote: Mae West is an intimidating dame. She just got finished doing a short stint in prison because of a play she wrote and acted in. • • The Mae West Blog was started fourteen years ago in July 2004. You are reading the 4078th blog post. Unlike many blogs, which draw upon reprinted content from a newspaper or a magazine and/ or summaries, links, or photos, the mainstay of this blog is its fresh material focused on the life and career of Mae West, herself an American original. Fun post today. Mae West would have made a fine President indeed! Way ahead of her time in positive outlook for all people, the times today could take a lot from this remarkable woman.